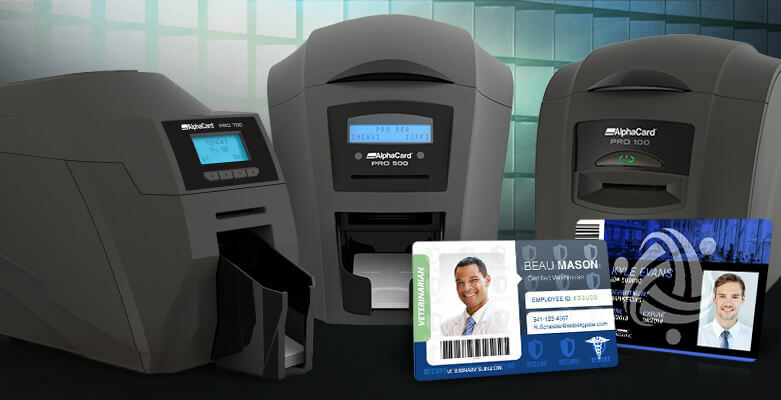 Upgrade your ID card program with a PRO printer giving you access to high-quality printing, built-in FREE visual security, an industry-leading warranty, and one year FREE VIP service and support! Shop all AlphaCard PRO printers and systems. If you want cards with visual security elements without paying for expensive upgrades or custom lamination film, an AlphaCard PRO printer is your best choice because of the exclusive built-in AlphaGuard technology included in every printer! With AlphaGuard you can add a hologram-like watermark over the top of your ID cards at no extra cost and with no special supplies required – the printer simply uses the overcoat panel of a normal ribbon to create the AlphaGuard design. On the PRO 100 and PRO 500 you can choose from four pre-built designs built into the printer driver. On the AlphaCard PRO 700 you can choose from five pre-built designs or design your own Custom AlphaGuard design (please note, Custom AlphaGuard is only compatible with PC computers). For a limited time we’re including your first Custom AlphaGuard grid design for FREE, a savings of $598! See how AlphaGuard watermark technology works. We stand behind the quality of our PRO ID card printers, but just in case something happens, we are backing the printers with industry-leading warranties. AlphaCard PRO printers also qualify for our new Pro-Xchange program, designed to take the hassles out of the normal printer repair process. Instead of sending your printer in for repair, waiting for it to be fixed, and then waiting for it to be shipped back to you, we’ll send you a comparable replacement printer that is yours to keep, no waiting and no hassle! Get the warranty and Pro-Xchange details. AlphaCarePlus is available for $298 per year, but for our AlphaCard PRO printers we are including the first year FREE! See all the VIP benefits of AlphaCarePlus service and support.